A 30-something year old male presented to the ED of an outside hospital complaining of palpitations that had been occuring intermittently for about a month. When he had awoke that morning they were present and had not abated as they had in previous instances, so he went to the ED. No prior medical history, no medication, no alcohol, tobacco or illegal drug use was reported. The ED physician contacted a cardiologist at our institution for transport of the patient and admission to cardiology. The patient’s heart rate was in the 160’s and above, but he was hemodynamically stable, nonetheless an antiarrhythmic drug was started and his heart rate slowed prior to transport. After an hour and a half transport from the outside hospital the patient arrived and was placed on telemetry. He was noted to have a rapid heart rate in excess of 190 beats per minute. Subsequently the following 12-lead EKG was obtained. As you can see, the heart rate is actually exceeding 200 BPM in this shot. No P waves are seen as either they aren’t present or the rate is too fast and they blend into the QRS. But how could a guy who’s rate had been controlled prior to leaving the oustide hospital suddenly ramp up? Well, if you run out of the drug, in this case procainamide, halfway through transport, you tend to have problems. Evidently, the medics misjudged the length of transport and left with less than half a bag, which at the rate of the infusion was no going to last them all the way to our facility. So they ran dry en route and this gent’s heart rate started to go back up as the procainamide wore off. So what’s going on with this guy? If you guessed WPW, you would be correct. Notice the delta wave that is present, most notably in leads II and III. Coupled with the rapid rate it is a near classic presentation of WPW. But what is it? 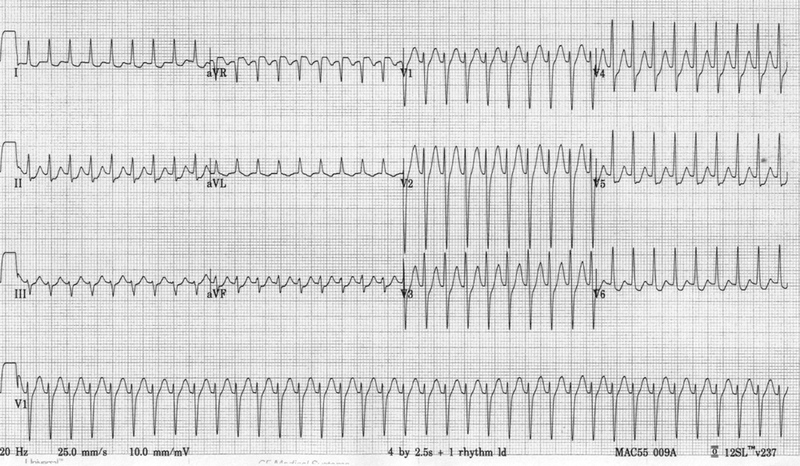 Wolf-Parkinson-White Syndrome is classified as a pre-excitation arrhythmia where electrical impulses leaving ther SA node travel through an accessory bundle of nerve fibers called the bundle of Kent and travel directly to the ventricle, usually the left, sparking a depolarization before the regular impulse travels through the AV node, or pre-exciting the ventricles. Notice the short PR interval that leads into the delta-wave of the QRS, this is the electrical stimulus traveling through the accessory pathway to the ventricles. Typically, the bundle of Kent is present in the fetus, but then is electrically isolated by furhter development, in individuals with WPW, this didn’t happen. When patients are ina normal sinus rhythm, the haert rate can remain controlled, but in people in atrial fibrillation or atrial flutter, the rapid, chaotic atrial impulses are conducted directly to the ventricles resulting in heart rates up to 300 bpm and usually subsequent arrest. As you can see there though, just because you’re in normal sinus rhythm doesn’t mean your rate can’t rapidly rise. Treatment of individuals with WPW can be complicated especiallywhen they present with AFib, as normal pharmacological treament, calcium channel blockers, beta blockers, tend to reduce the conduction through the AV node allowing the impulses through the accesory bundle to maintain and even accelarte the heart rate. 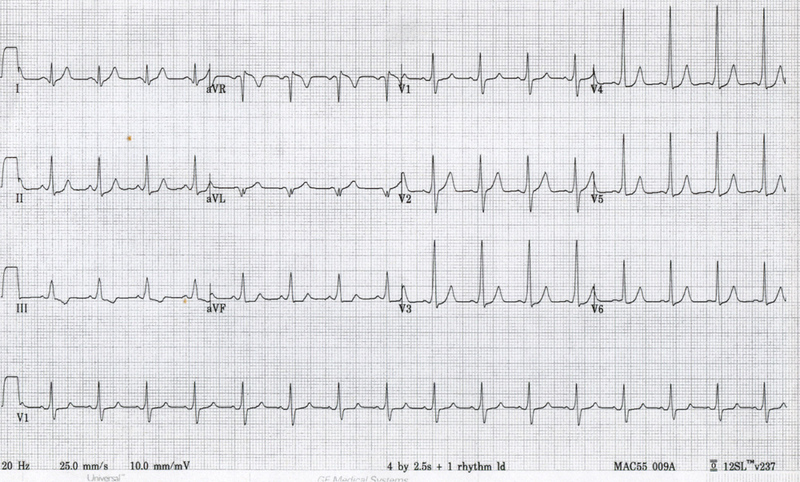 In cases like this patient, antiarrhythmics, like procainamide and amidarone can be used to control the heart rate. Typically, and in this case, a trip to the EP lab is in order to have the accessory bundle mapped and ablated thereby blocking the pathway.